Earlier this week, for our first annual Christmas lunch, I took my church staff to a restaurant called Canopy on Montrose Boulevard in Houston. 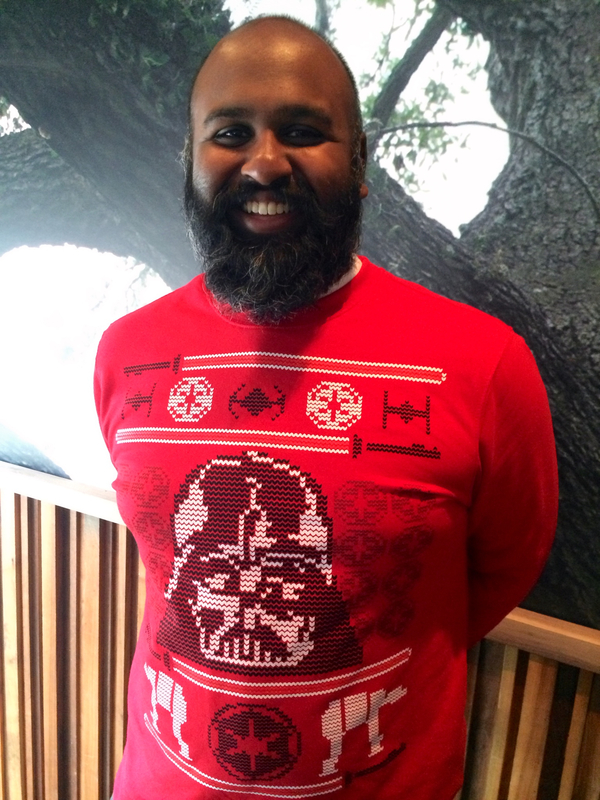 The biggest surprise was the awesome, Star Wars-themed sweater that one of our colleagues, pictured below, wore to the celebration. Yes, the Morning Star dispels even the dark side. That’s good news for the whole universe, including Darth Vader. Seriously. Christmas sweaters — whether ugly or awesome — are this week’s haiku theme. Take one of those images, or perhaps a memory of something that happened while you were wearing one of these, and write a verse about it with five syllables in the first line, seven syllables in the second line, and five syllables in the third line. John Lindsay, a former mayor of New York City, died 14 years ago today on Hilton Head Island, South Carolina, where I was the curate at All Saints Episcopal Church. Soon thereafter I was asked to come to the funeral home to pray with a widow and her family without knowing that it was Mayor Lindsay’s family. I said that I was happy to do so but mentioned that it happened to be the day of our staff Christmas party and that I was, therefore, wearing a Christmas sweater instead of my usual priestly clothes. Sitting with that family, wearing a festive green and red sweater while clinging to my stole and Book of Common Prayer, seemed both weird and wonderful all at the same time. “Comfort, comfort my people,” writes Isaiah. it shouts- I LOVE YOU!!!! !